This is the time when we would like to share the progress of MGVS work, with all of our friends and well-wishers, as all of you have been a part of a journey to promote sustainable development in the remote areas of the Himalayas. We are currently engaged in sustainable development activities, according to a plan which was developed with the people of fourteen villages of the Naugun Valley. Priorities of the plan include building confidence of the community through organizational efforts, upliftment of people with disabilities, women, widows, children and poorest families, and improving the health status of the area. The Naugun Valley is located in an interior part of Tehri Garhwal, near the Tehri Dam, in this part of North India. The phase-out process MGVS was engaged in, has now been completed in the Saklana Valley area, and responsibility for ongoing development activities has been handed over to the actual stakeholders of the community. Our team continues to make visits every three months to monitor progress and help the community with their questions and hurdles. We would also like to share the exciting news with you, that MGVS has recently finished a construction project for the Kaplani High School, and the new building, called the Heidi Parker Memorial Building, has been inaugurated and it is now officially open for use. On behalf of the MGVS team, please accept our deep gratitude for your long-standing encouragement and continued help. Without your compassionate support, we would not be in a position to help brighten the lives of the marginalized living in remote areas of Garhwal. Thank you so much for your on-going support and your prayers. The MGVS team joins me in sending our best wishes to all of you for Christmas and the New Year! 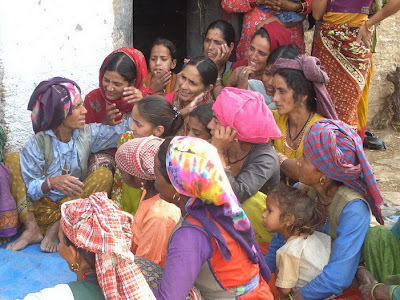 MGVS has identified approximately seventy-three extremely poor families who are living within seven Gram Panchayats of Naugun Patti, through village meetings and home visits. We have made efforts to address some of the immediate needs among these families, through Income Generation Projects (IGP) for the extremely poor and destitute, with a focus on widows and the disabled. Eleven families were assisted in starting up goatries in February and March 2010 with four goats each (3 female and 1 male). IGP training on running a successful, and environmentally friendly, goatry business was given to each family before and after the goatries were started up. On July 14th, 2010, ten other families started poultry income generation projects with twenty-five one month-old chickens each. 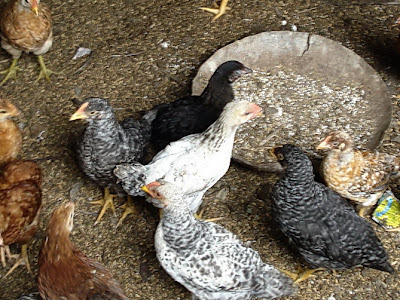 At present MGVS is working with the local government veterinarian, who has finally started to visit the area and we are encouraging the villagers and their local pradhans to apply for available poultry govt. schemes. MGVS is also assisting in the planting of fruit trees as a part of income generation efforts. From December 2009 to February 2010, detailed personal interviews with 30 poorest families were completed. Documents were checked and information regarding govt. schemes being accessed, or not being accessed, was obtained and each family was informed of available govt. schemes they were not already accessing. By the end of March, 2010, we had introduced 21 of these poorest families to their ward members and the pradhans (chiefs) of their Panchayat, in order to regularize documents needed to access govt. schemes. Progress is steady and rewarding: in February and March 2010, seven of these families began the process of obtaining Job Cards, needed to access the 100 Days Guaranteed Employment scheme, and one family acquired their pension documents. MGVS has successfully encouraged the activation and proper formation of eight Self-Help Groups (SHGs) in the Naugun Patti area. Some of these groups had already “formed” previously, but only existed on paper at the Block office in Thauldhar. MGVS started out by identifying, and meeting with, the members of the existing Women’s SHGs and the Men’s SHGs of the area. None of these groups were active at that time: meetings were not being held, and some of the “registered” womens’ groups were being controlled by the interests of men. In one case, MGVS found that some money that a women’s SHG had managed to save, was spent on temple repairs. The decision to spend the money was made by men in the village, and the women were not consulted. MGVS encouraged men’s and women’s groups to start internal credit/loaning activities, of which each of these groups was previously unaware. And then in February and March 2010, SHG meetings actually started to take place for four women’s SHGs and four men’s SHGs in villages: Jamni, Kyarda, Vikol and Ghiyakoti. With a focus on empowering both the women’s and the men’s SHGs, MGVS is working with these groups, helping them to understand how they can make positive changes for their villages and community as a whole. We are also organizing and providing various trainings on gender, income generation, government schemes etc. MGVS continues to encourage other groups to form and begin group activities. MGVS organized two exposure visits for the officers of the self-help groups as well as the pradhans (Village Council Chiefs) and panchayat representatives of the area, with other SHGs already making change, including farmers’ cooperatives that had grown from SHG activities. MGVS arranged the visits with NGO Bhuwneshwari Mahila Ashram, in Anjani Sen, Tehri Garwal in March 2010, and the Rural Women Farmers Organic Cooperative and the Semwalgaon II Women’s SHG in Saklana Patti (the previous MGVS working area), in April 2010. These visits really encouraged some of the inactive groups to form properly and to engage in group activities, and sparked an interest in organic farming workshops. The women of Kyarda Village encouraged their fellow village women to form a Self-Help Group, shortly after the first exposure visit, independent of help from men in the village, and they put funds together for loaning/savings activities. The women of this group planted Malta fruit trees together, and they are thinking about how to make and possibly sell Rhododendron juice next spring and they have participated in food processing training organized by MGVS. The Ghiyakoti Village women’s SHG attended their first real meeting and organized funds to open a bank account within a week of the exposure visit to Saklana Patti. These women were also keen to start leek and gobo nurseries. 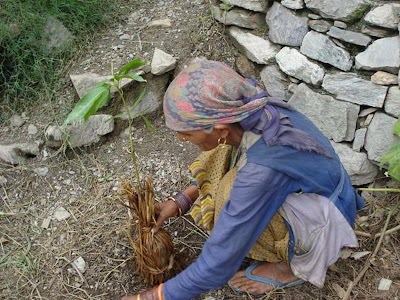 So on April 21, 2010, MGVS assisted in setting up a vegetable nursery, including leeks, through demonstration in Ghiyakoti Village: 8 women from the women’s SHG participated. The Vikol Village women’s SHG followed on April 22, 2010. 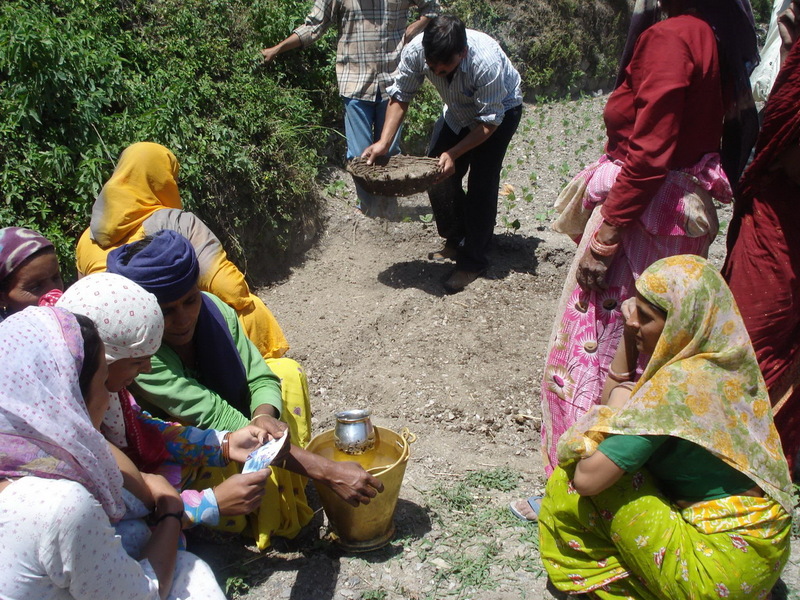 MGVS assisted in setting up Vegetable Nursery through demonstration and here also, 8 women participated. Since then, other villages have become interested to learn about organic farming and MGVS has provided many nursery demonstrations in the valley. MGVS is also conducting workshops with the women’s groups of the valley on the formation of a farmers’ cooperative. To maintain soil standards, the Cooperative encouraged their members to have their soil tested. On May 8, 2009, twenty-one Co-op/Sub-Co-op members (9 men and 12 women farmers) provided samples from 1-3 fields each for testing. Sub-Co-op member, Mr. Bachan Singh of Matiyangaon, conducted the testing for his fellow Co-op/Sub-Co-op members together with MGVS. Mr. Singh had taken an interest in learning how to test soil after he had participated in an exposure visit to other Cooperatives outside the valley, arranged by MGVS previously. The results of the soil tests were shared with farmers. Generally the samples were on the low side for nitrogen, phosphorous as well as potash levels, which helped Co-op and Sub-Co-op farmers understand the need for making more of an effort to produce, and use, natural fertilizers. Soil testing results revealed no chemical residues. The Cooperative has become an important source of information to other farmers in the valley, regarding sustainable farming methods. The Cooperative has also recently received groups from other areas as part of an Exposure Visit, to share their experience with farmers outside their valley. The Cooperative has been selling their leeks weekly to wholesalers in Delhi for over a year now, but MGVS has focused on encouraging the Cooperative to take on more responsibility for marketing their grains and produce. 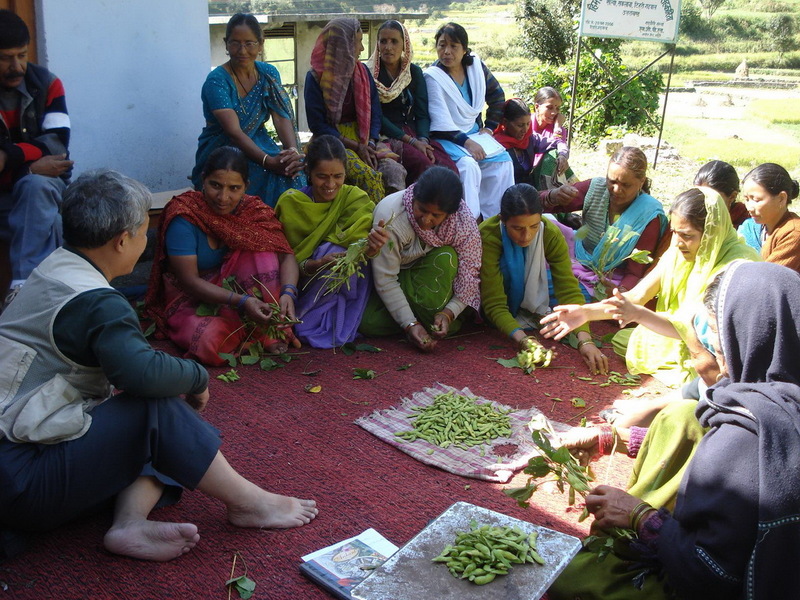 MGVS arranged two evaluations of Cooperative activities in October and November of 2009 and we also invited Dr. Miura, Dean of the Agricultural Institute in Allahabad, to visit the Cooperative on October 9, 2009, to offer training on marketing. Dr. Miura explained how to improve profits, encouraging an increased understanding of three concepts: Quality, Quantity and Regularity. As a result of the evaluations and training, the Cooperative increased their rates and handled the sales and shipping to various wholesalers by truck, train and XPS Courier, themselves from December 2009 to April 2010, to cities: Gurgaon, New Delhi, Allahabad. MGVS continues to assist with ensuring payments are made to the Co-operative by e-mail follow-up, and by encouraging consumers and wholesalers to contact the Cooperative directly. From March 15th – March 20th, 2010, a group of students and staff from Greenough & Nobles School, Massachussetts, USA, visited MGVS once again this year. This group hiked down to Donk Primary School every day of the week. Some of the group also spent time at Kaplani School. They learned about the school and the lives of Kaplani School students. Cultural exchange activities involved sharing US/Indian colloquial expressions, games and dance instruction. Down in Donk Village, the group was involved in a service project which involved making repairs to the Donk Primary School, constructing a second toilet for the school, so that there is now a toilet for both boys and girls, as well as repairing the Patrani-Donk pipeline. 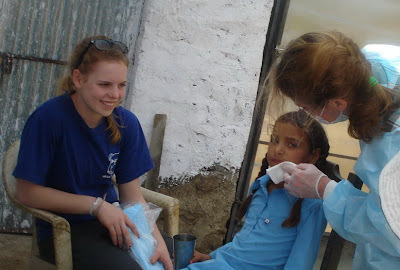 Finally, a dental program including screening, treatments and a hospital visit was completed by a Dr. Wendy Cheney and hygienist, Ms. Joanne Wastrom, who joined the Nobles group for this service project. On Saturday, after all the work was done, the group walked to Donk again to celebrate with the villagers, with dancing, drumming and a community lunch. 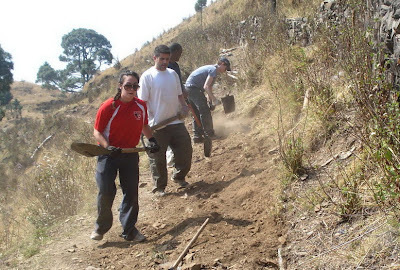 Nobles School students and staff repair pipeline that feeds Donk Primary School.